With the worst of winter finally seeming to be over, we can now turn our attention to spring with greater confidence in the better weather to come. So, is it time to shed that winter beard in favour of a fresh spring shave? If so, where do you start in selecting products to prepare your skin for its big reveal? And which brands can be most trusted with your most prized asset, your face? 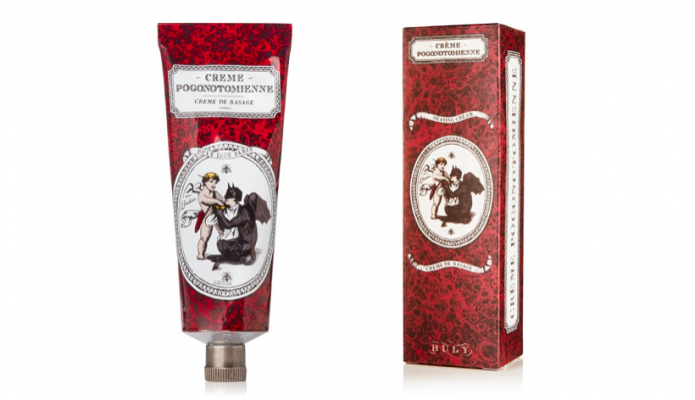 Here at Grooming Towers we have done the leg work for you and recommend that you entrust your spring shave to Buly 1803’s, ‘Creme Pogonotomienne’ shaving cream. If you are as intrigued by the name as us, rest assured that it has nothing to do with leaping about on a pogo stick (thank goodness!) but is derived from the Greek term ‘Pogos’, meaning beard, and ‘Temno’ meaning to cut. So essentially, this product does what it says on the tin as it has been specially formulated to provide you with the cleanest of shaves. The rich maroon packaging of this shaving cream hints towards Buly 1803’s mastery of luxury, developed in Parisian dispensaries and practiced for a great many years. And the product inside continues to deliver as it remains true to traditional methods and ancient recipes, while drawing on the most innovative modern cosmetic techniques. The best of Parisian chic both past and the present! As soon as you apply this product, you are pleasantly greeted with scents of burnt Hinoki wood and sweet Almond to soothe the skin, with the unique formula softening the hairs for the closest of shaves. Containing an ingenious concoction of all natural ingredients, this shave cream can be used even by those with the most sensitive of skin as it soothes away any blemish which may appear post shave. As a result of this ‘Creme Pogonotomienne’ gets a firm thumbs up from us here at Grooming Towers to shave away those winter blues and appear fresh faced, ready for spring.